Within the fascinating world of animal behaviour and training Dr Sophia Yin has become a giant. 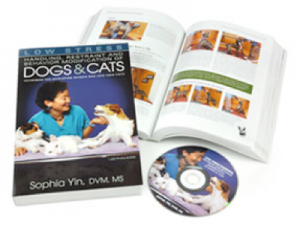 Her last book ‘Low Stress Handling, Restraint and Behavior Modification Of Cats And Dogs’ opened the eyes of many veterinarians and animal handlers and is now seen by many of her peers as the definitive reference book on the subject. Here Anita Kelsey, who herself is passionately interested in the psychology of cats, caught up with Dr Sophia Yin to discuss all things animal. 1.I am a great admirer of your work and try to follow your techniques from your book ‘Low Stress Handling’. When did you first realise you had an affinity with animals? Was working with them always going to be the path you took in life? I always loved animals even when I was 5 years old. So, even at that age, I knew I wanted to be a veterinarian. I worked at veterinary hospitals in high-school. Then in college, for a short period I thought maybe I’d be a biochemist, because that was my major and I loved my coursework. But several laboratory internships later and I realised that I’d rather work helping animals. 2.I read in a previous interview that you became interested in behaviour training after a problem you had with your own dog? Can you tell us about that period in your life and the journey you took with your dog? When I was in high school and working at a veterinary hospital my parents got me a Boxer for my birthday. As the puppy grow up he became aggressive to us and my supervisor, who met him, warned me that I really needed to do something about him or I’d have to euthanise him down the road. The problem is that the only help available was regular dog trainers and at that time all dog training was force-based/dominance based. So when I took him to trainers he actually got worse. In fact the first training class is where he learned to lunge and snap at me and climb up the leash when he thought he was going to get a correction. That class started about a 7-8 year struggle, where I worked with many trainers and did exactly what they told me to do. Some of these training procedures were horrific and, although I was seen as a good student, I knew there must be something better. After about 10 trainers I finally found high level obedience competition trainers who were just starting to apply what they learned from Don’t Shoot The Dog. So they were more science-based even though they still did use force. Ultimately my dog did pretty well in obedience competitions, scoring above 190. Even though I had made many mistakes he was much better behaved and I felt safe around him. However I knew that due to the training processes I had started with, I had lost something in our relationship that I would never get back. And even worse, I knew that if I had known what I know now, I could have solved the issues in a few weeks to a month instead of years! My experience made me very sensitive to the fact that as a veterinarian, it was my job to help others avoid the huge ordeal that I had experienced with my dog. 3. Who has inspired you on your incredible journey and why? Probably anyone serious about animal training in the 1980s and 1990s. When I was getting interested I was greatly influenced by Karen Pryor, who brought clicker training to the masses, Dr. Patricia McConnell who introduced dog trainers to ethology, and Bob Bailey, the Master of operant technology. In addition my biochemisty instructors when I was an undergraduate and my animal behavior instructors and advisors – such as Ed Price, Don Owings, Peter Marler—during my Master’s program after veterinary school, really shaped my broad understanding of behavior and medicine. The focus during those periods of my education was on problem solving, setting up hypotheses and predictions and always questioning what you read and see. I learned that the fun was in always searching for more answers. Each answer expands your knowledge but generates even more questions. It’s a process that is maddening to the general public, but as a scientist, curiosity is what fuels my drive. For a scientist, when you know everything you want to know and you’ve answered all your questions, then it’s time be quiet and go into another field. I’ll be asking questions and finding answers for many years to come. 4. As a person constantly studying the behaviour of cats and who also grooms cats, I often come across extremely difficult cases whereby I am torn between different methods of moving forward. I am sure all cat groomers would like me to ask you the following question: Faced with a badly matted cat, who is fearful and extremely aggressive (possibly due to past traumas connected to grooming), do you feel it’s counter-productive to groom under sedation when visiting the vets and grooming under sedation are equally traumatic for the cat? Do you feel these types of cats (highly aggressive due to fear) can ever be conditioned to tolerate being groomed without sedation? Yes these cats should definitely be sedated since grooming them without sedation can teach them to hate going to the groomer! If the hospital has a Low Stress Handling plan for getting this cat into a quite room, and sedated quickly and skillfully (http://drsophiayin.com/blog/entry/sedating-the-killer-cat), then the stress should only last a couple of seconds. Once the badly matted cat is clipped, then the owner should work on a plan of training the cat to love getting groomed. This can be done by having short daily sessions (several minutes) where they feed the cat tasty treats (such as canned cat food) and pair the feeding with light grooming for just a few seconds at a time. Then they can groom systematically longer periods of time and with more pressure as long as they always stay below the threshold that bothers the cat. 5. Can you name some of the most common mistakes your students, or certain staff in veterinary surgeries, make when handling nervous dogs or cats? The number one mistake is that people approach dogs head on and move into their personal space rather than giving the dog time to habituate or tossing treats to counter-condition and then approach sideways or backwards. Then with both dogs and cats, veterinary staff tend to use force restraint when what they really need to do is to know the specific technique for controlling movement in six directions – front, back, up, down, right, left. They need to know how to get into the hold in a non-threatening manner, how to adapt to the hold that suits the pet. They also need to know how to make the hospital more comfortable and less scary. For cats, veterinary staff automatically stretch or scruff them and cats tend to dislike both. Cats should never be stretched and they should not be automatically stretched. Instead, it’s important to know how to control movement in all 7 directions while using minimal pressure and often minimal contact. 6. Do you still practice medical veterinary work or is most of your work behavioural now? I’m so busy I don’t have time to work in a regular practice right now. So for now my focus is on developing behavior systems, training programs and improving methods for teaching professionals as well as pet enthusiasts. 7. US cat behaviourist Jackson Galaxy, who I interviewed recently, wrote your name down and said he would like to learn more about your work. Are there any animal behaviourists, or professional people connected to animal welfare, whose work you admire and wish to tell us about? I have many colleagues that I admire and I spend time every year learning from them. For instance, this year I spent a week on the Ohio State University School of Veterinary Medicine’s Community Practice service where they have integrated Low Stress Handling. At the time they had Applied Animal Behaviorist Traci Shreyer facilitating the program. Then in May when I was in Sweden I spent a week with at HundeCampus learning from Lennart Wetterholm, probably the best scent dog trainer one could meet. I enjoy working with those who approach training from an evidence-based manner -always testing techniques and coming up with hypotheses and predictions to examine. And always seeking to learn. I also have had the privilege of behind the scene training/enrichment tours of zoos in Copenhagen, Louisville, Denver, Dallas, and the Dolphinarium in the Netherlands this year as well as fascinating conversations with behavior specialists and keepers regarding welfare, enrichment, and how they try to determine whether the animals are happy. 8. I’m a huge advocate of banning de-clawing worldwide. (Over in the UK it is already illegal). May I ask if you have seen the recent documentary ‘The Paw Project’ and what your thoughts are on the practise of de-clawing and the whole campaign to get it banned? I would never want one of my cats declawed and I recommend against declawing cats. We need to do a better job of helping pet parents understand how to prevent scratching in undesired areas, and how to train alternative appropriate behaviors instead. We also need to help owners learn how to train cats to love having their toenails trimmed. Declawing should not be routine or seen as a quick fix to a problem or a replacement for understanding their cat and implementing some simple behavior modification plans. I do believe that in the U.S. where cats are relinquished to shelters for any little reason, that even with education, some owners won’t go for the behavior modification and if declawing weren’t allowed would just send their cat to the shelter. 9. What do you do to relax away from the huge amount of work you must have with all of your books, training, seminars and behaviour consultations. How do you juggle such a huge workload? Luckily I love my job so my extra time is often spent related to my dog – running with him or training and playing with him. I’m also a runner, which is handy for getting the dog his exercise. When I have time I go to the boxing gym, and I used to swing dance quite a bit. 10. Regarding cat nutrition. What are your personal thoughts on a dry kibble only diet vs wet food or raw diet? I feed my cat cat food that’s AAFCO certified balanced for my cat’s stage of life through feeding trials. I don’t just stick to one brand. When pet parents switch between brands, I recommend they do it over several days and also monitor their cat’s faeces to look for diaorrhea or other signs of gut upset. Cats are individuals so there is variability in how they respond to different diets. For cats that are prone to developing bladder stones or those who need a high water intake it’s a good idea to feed canned food due to the higher water content. I don’t recommend raw food diets. All board certified veterinary nutritionists recommend against raw food diets, especially all meat diets. Theoretically, if I wanted to feed cats what was most natural, I’d feed them live mice and other rodents so that they could eat the entire animal and get enrichment in the process too, but that’s gross. Plus there are a number of pathogens they can pick up from eating raw animals. When people are making a choice about diet, I think it’s important that people know that they understand that animals are NOT actually perfectly adapted to the environments in which they evolve. That is, animals are maximally equipped to deal with all aspects of their environments, they are just better equipped than the other animals/plants etc they are competing against. So, animals in the wild may eat other animals raw and survive relatively well. However, that doesn’t mean that the rawness of their diet is actually good. It’s just that animals in the wild don’t have the option to cook their food! Similarly animals such as Arctic wolves may have evolved to survive the long winter (although many die during those extremely cold and dark months). However, that doesn’t mean that Arctic wolves in zoos need to have several months of sub zero weather for maximal health. I recommend a diet that’s AAFCO certified via feeding trails. (More info from AAFCO regarding cat food – authors note) Or if people want to cook for their cat, I recommend they work with a Board Certified nutritionist (such as through balanceit.com) to get the right information about the right home cooked diet for their cat. 11. Name three things that you would like to see changed connected to animal welfare? Frequently we do what we’ve been told we should do with our pets but we don’t ask ourselves the hard questions that zoos do. How do I know when my pet or another animal is happy? How do I provide for their behavioral needs. Good zoos and keepers take into account what an animal might do in the wild and for how long. They aim to provide similar types of enrichment and for similar amounts of time. Then they evaluate based on how the animals act, whether the animals are happy. The 2nd major change I’d like to see is an end to force or coercion based training. While all animals will have some stress when learning (it’s natural to be frustrated when you can’t figure out what you’re supposed to do), stress caused when humans take an approach that assumes the animal is trying to be high ranked and needs to be put in it’s place, is on a completely different plane. The approach people should be taking it to figure out what specifically is motivating or reinforcing the behavior. Then focus on reinforcing a more appropriate behavior and removing reinforcers for the unwanted behavior. e.g. if a cat is meowing at you for food, avoid giving the food, and instead reward for calm quiet behavior. My third change would be handling in the professional setting: almost everyone who goes into an animal related field does so because we love animals, and yet, because most professionals were not taught specifically low stress handling skills in school or even taught about behavior, a majority of professionals (vets, technicians, kennel workers, groomers, shelters workers) handle animals in a manner that actually adds to the animals’ stress! Everyone needs to learn the body language of fear anxiety, and how to approach animals in a less threatening manner. And anyone who deals with animals needs to learn how to actually physically guide and restrain an animal in a manner that helps the animal feel safe and secure rather than confused and scared. There’s a lot of technique involved; however it’s all quite straightforward. Even if you’re a dog trainer using clicker training, it’s important to know how handy it is for owners to know how to help an animal to understand how to, for instance, stand stationary when they are in a situation where they won’t eat food (hence food rewards can’t be used). That way, owners are empowered in situations such as the veterinary hospital because their animals already know the routine and are happy with it. 12. What do you feel are the biggest misconceptions cat owners have when getting a cat? The biggest misconception is that cats are aloof and untrainable. I just gave a lecture at the American Veterinary Medical Association conference, where I showed how just training 3 exercises—sit, target, come—can help solve a majority of behavior issues a pet owner might come across. One of the main points I stressed was that cats are actually easier to train with these behaviors than dogs. I showed how each could be trained within 5 minutes! Besides training and trainability a huge issue is that people don’t realise they should be socialising their kittens just like puppy owners are supposed to socialise their puppies. By doing so, they can develop a kitten that’s as outgoing as the average dog and who is less likely to spray, hide from guests or be aggressive to other animals in the house. 13. We all have your book ‘Low Stress Handling, Restraint and Behavior Modification Of Cats And Dogs’ (pictured left). Are there any new projects/books on the horizon? Yes, many. I have a Kitty Kindergarten DVD coming out in about a month on how to socialise your kitten and run a kitty kindergarten. It’s a recording of a live lecture that I have given at a number of veterinary conferences. Next year we will come out with a dog training certificate program and certification on skills performing the exercises in our training system. We’ll also hopefully fully unveil our behavior coding system for assessing handler technique and dog response. 14. I notice you are coming to the UK soon, which is really exciting. Can you tell us about your visit and any dates we should be marking in our diaries? I’ll be lecturing in the UK in September 2015 at The Top Dog Seminars. 15. If you had to choose another profession in life, away from what you are doing now, what would that be? Well, I guess if, for instance, I had to go into witness protection for some reason, then I’d have to go into a completely different career but one that would be equally rewarding and interesting. I recently listened to a TEDTalk where the lecturer talked about sustainable seafood and how one company in Spain, Veta Le Palma, took land damaged by cattle farming and re-stored the land into a Marshland habitat while simultaneously creating a successful fish farm. I think I might be involved in something like that because it’s interesting, unique, educational and good for the environment. The area serves not only to produce fish but to provide the largest bird refuge in Europe (250 different species). Birds naturally flock to the area. The place is already a tourist attraction. It would be fun to create an educational program where people learned about the social lives of the birds and other animals in the habitat (vs just the species and a few facts). 16. On a recent behaviour consultation I was dealing with a client who was a dog person and he just didn’t get cats. Could you explain how you see the differences in approach and behaviour techniques between cats and dogs? One main difference is that dogs have evolved to work closely with humans. So, even if humans are bad at training, some dogs want to figure out what their humans want and do it anyway. That is, some individuals are highly motivated to work for praise and attention and to try to figure out what it is that the human wants. Training cats requires a little bit of skill. That is, the humans need to figure out what’s motivating to the cat (often food rather than praise or petting) and then reward at the correct time. Once humans know to do that, then they can quickly learn that cats can actually be easier to train than dogs! Once people understand this, they can also bond much better with their cats because they understand that they can influence how their cat behaves. Thank you so much for your time. It is very much appreciated. No doubt Dr Sophia Yin will be training another animal at a venue near you shortly!